Diving Adelaide works a progressive pricing system! 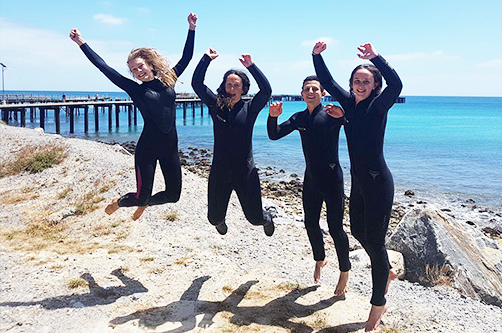 Sign up with one or more friends for the Advanced Open Water Diver course and receive big discounts for each friend that you sign up with (each)! So if you have decided to sign up for a course, make sure you call all your friends first! Not only will this make the course more fun, it also assures you that you are getting the best value for money! $364 Bring 1 friend – SAVE $25 per person! $349 Bring 2 friends – SAVE $40 per person! $339 Bring 3 friends – SAVE $50 per person! $325 Bring 4 friends – SAVE $64 per person! 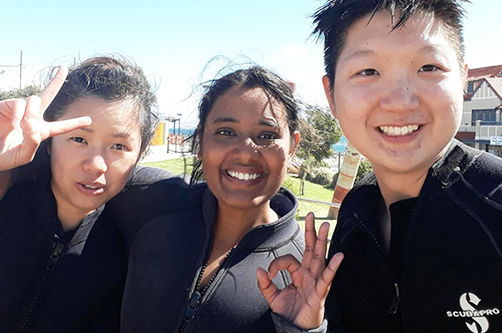 Start your continuing diving education today with the friendly and professional PADI diving instructors of Diving Adelaide! 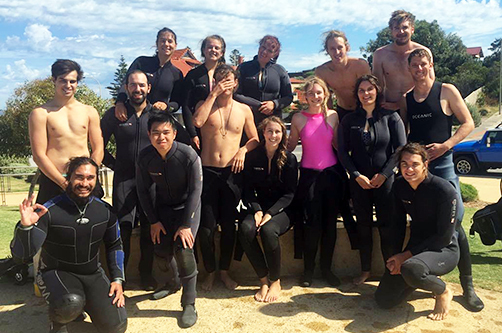 Continuing your education by taking the Diving Adelaide Advanced Course will improve your diving skills by completing 5 adventure dives an instructor. On each of these dives we will further develop each of those “specialty skills” so you become a better, safer and more comfortable diver. The advanced course will prepare you to safely and confidently dive at night, find your way underwater, perfect your buoyancy, plan your dive and dive your plan at multiple levels using a dive computer and to dive down to depths of 30 metres! Dive 1: Peak Performance Buoyancy. During this buoyancy workshop you will do different buoyancy exercises and your instructor will try to take as many weights of your weightbelt as possible. Remember, the less weights you have on your weightbelt, the less energy diving will cost which results in a lower overall air consumption and you becoming a better more relaxed diver. Dive 2: Navigation. One of the most important underwater skills (and one that you will certainly enjoy a lot) is being able to find your way back to the entry/exit point without having to surface. This is a obviously a very important skill for those divers who want to go diving with their buddy but without a dive professional to follow around! You will practice all of these techniques on your dive.During the navigation workshop you will learn to dive different patterns (such as a square pattern) and to use natural and man made references (such as a reef, a jetty or a sloping bottom) to pinpoint your location underwater and find your way accordingly so you get the longest bottom time and have a more enjoyable dive. Dive 3: Digital U/W Photography. Learn how to shoot the perfect underwater shot! This adventure dives builds on the first two adventure dives in that you have to navigate (to find your way back) and control your buoyancy while focussing on taking quality shots underwater! Our experienced instructors will show you how to greatly improve your underwater shots by teaching you a set of simple (but very effective) tricks such as getting as close to your subject as you can (and then a little bit closer)! Dive 4: Deep. The deep dive is for many people one of the most exciting dives of the course. On this dive you will be introduced to a phenomenon called nitrogen narcosis. We go to a depth between 25 and 30 metres (if weather permits we go to the Stanvac Barges for a 29m dive!) and will show you what great depths like that can do to you, your mind and your body. Remember that the deeper you go, the more air you will use and the less colours you will see (at 30 metres everything will seem very blue – until you switch on a dive light!). Being certified as an Open Water Diver, you already had access to about 50% of all dive sites around the world. Doing this dive will open up another 40% of all dive sites world wide (you will need to do specialised deep dive or technical training to open up the last 10%!). Dive 5: Wreck. Even though it’s important to know how to use a basic dive table, nowadays most divers use a computer to plan, monitor and log their dives. Using a computer will allow you to have longer bottom times than when planned with the conventional dive table. Especially now that we can dive to depths of 30 metres, it is important to monitor our gauges, because of the limited time that we can spend at these depths. When doing more than one dive a day (and especially when deep diving), it is important to keep track of your no decompression limits. The most effective and enjoyable way of keeping track of these limits is by using a multi-level tool or your dive computer (and it will tell you a whole lot of other information that’s good to know before, during or after the dive too!). The most convenient place for a multilevel dive is a wreck, so on this dive we explore one of the many wrecks that SA has to offer! Optional: Night. You wouldn’t believe how different a dive site looks at night, unless you would see it with your own eyes! At night all the crabs, shrimps and octopus come out of their crevices and there is an explosion of life on the reef. As night diving is not for everybody, we offer the night dive as an optional add on to your advanced course. We usually go night diving on the Thursday night after the course and the additional cost for this adventure dive is only $60! Optional: Enriched Air Nitrox (full certification). You may have heard about diving on enriched air and wondered what it means and why you would like to do it. Having enriched air in your cylinder, means that you’re diving with air with a higher percentage of oxygen than normal air (the air we normally breathe consists roughly of 21% oxygen and 79% nitrogen. A common enriched air mix consists of 32% oxygen and 68% nitrogen). The reduced amount of nitrogen means that your body does not absorb as much nitrogen during a dive as it normally would, which means that you can have longer dives (because of higher no decompression limits) or have a safer dive with a lower risk of decompression illness (because you have less nitrogen in your body that needs to come out of solution on your ascend). The nitrox theory course can be added to the advanced course for only $99. Each of these dives give you a taste of the respective specialty course and will count towards getting your full specialty certification. For example, if you are really excited about deep diving and would like to become a Deep Diving Specialist, you can sign up for your Deep Diving Specialty Course. Normally, you need to do 4 dives to complete this specialty, but when you complete your advanced course, you will have already done the first training dive of the deep diving specialty course during your advanced course. So now you only have 3 more training dives left to do to complete the Deep Diving Specialty Course, which means you will save both time and money! To participate in this course, you have to be certified as an Open Water Diver. The course is designed in a way that you can take it straight after your Open Water Diver Course. There is no additional experience required. A minimum age of 12 years applies. Every student under the age of 18 needs to have a parent or a guardian sign a consent form (available from the dive centre). Students younger than 15 years old will attain a Junior Advanced certification. We meet at the dive centre on Wednesday evening at 6PM for a theory session, where we will discuss all the diving theory related to the five dives that we will be doing on the weekend. We meet either at the dive centre or at the dive site where we will be doing our three (shore) ocean dives of the day. We meet at the boat ramp on Sunday morning at 9AM, from where the boat will take us out to the dive sites where we will be doing our deep and wreck dives. After the dives we head back to the dive centre to fill out the paperwork and log our dives. 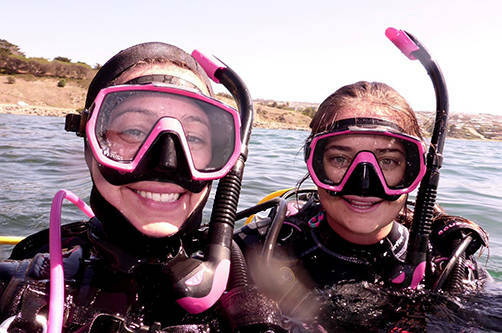 Have a look at these additional Reasons to Learn to Dive with Diving Adelaide! No, all gear will be provided by Diving Adelaide. However, to guarantee perfect fit and the most enjoyable experience, we do recommend coming in store to have a look at our masks, as the mask is the most important piece of equipment! How many dives do I need to do before I can sign up for the Advanced Course? The only prerequisite for starting your Advanced Course is that you have already learnt to dive and hold an Open Water Diver certification. 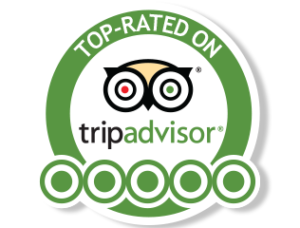 The course is designed in such a way that you can go straight from your Open Water Diver Course into the Advanced Course, so no additional experience is required. We do however recommend doing your Peak Performance Buoyancy Specialty Course before the course! Any dive centre around the world will recognise your PADI certification card and will allow you to dive with them. PADI is the largest certification agency in the world with more than 6000 dive centres. Even if you dive with a non-PADI dive centre, they will still recognise your certification! What happens when the weather isn’t looking too good? The main thing to remember is that we are going to get wet anyway, so if it rains a little bit that doesn’t matter (you will be nice and warm in your thick wetsuit anyway). However, we are of course dependent on the weather, with the wind and swell being the main factors that determine whether we can go diving or not. If the weather forecast predicts huge swells and high winds, we may have to transfer the course to a different weekend. We will of course notify you beforehand if this is the case!